By far Tigger’s favourite book has always been The Gruffalo, there is just something about that book that lights up his eyes and gets him excited about what is going to happen next (even though he has heard hundreds of times before). So with World Book Day approaching I jumped at the chance of reviewing the child’s Gruffalo costume from Joke.co.uk. Something I need to point out is that Tigger doesn’t do fancy dress, he will get all excited and possibly say that he wants to wear something however when it comes down it he will then refuse. So when this arrived I was a little worried as to whether he would actually put it on and where it. The costume is an all-in-one suit, complete with hood which doubles as the Gruffalo’s head. The hands and feet have elasticated, hook n loop straps on so that you can secure the costume over hands and shoes. Tigger is relatively short for his age and being at the lower end of the end bracket for this costume I was concerned it might dwarf him, however the elasticated straps on the hands and feet helped keep it in place without him tipping over etc. The costume comes with all the features you’d expect from the Gruffalo, personally I love the purple prickles all over his back. With a £28.99 RRP, I feel that is expensive for a child’s fancy dress costume although it is currently on offer for £19.99 which I feel is a more realistic price. The child’s Gruffalo costume is just one of many that are available in the World Book Day costume selection from Joke.co.uk. 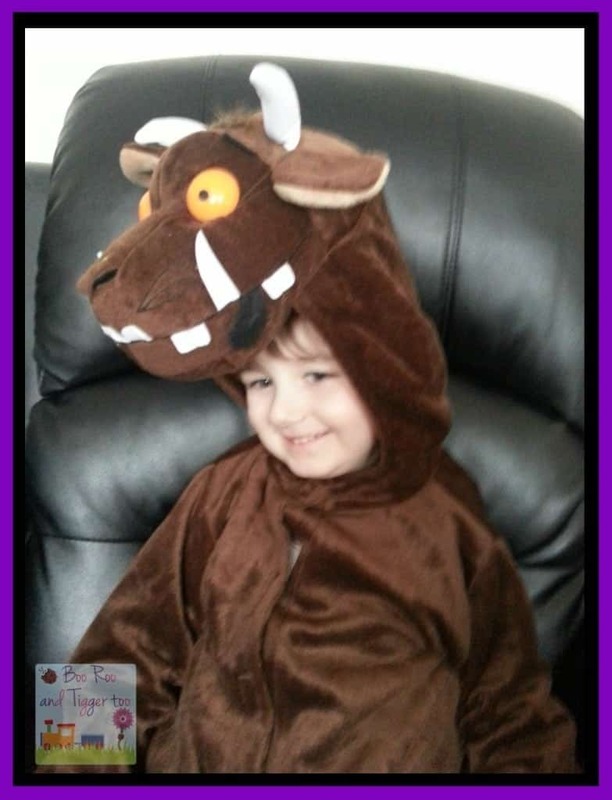 Disclosure: We received a child’s Gruffalo costume FOC for the purpose of review.